Cedar Grove Cemetery is located along the Neponset River in Dorchester, Massachusetts. The cemetery has a long history dating back to the late 19th century. The first burial took place on February 24, 1870. The cemetery’s board wanted a new site that would reflect both their history and — since they still do burials there — provide welcoming information for the community they serve. The cemetery is particularly known for its beautiful, serene, and wooded setting as well as for the unique fact that it is the only cemetery in the United States with a trolley (Mattapan-Ashmont “Red Line” of the Boston MBTA) running through it. 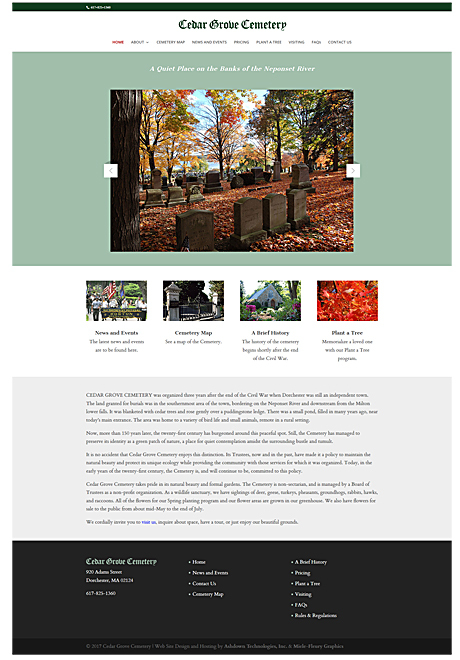 Visit the Cedar Grove Cemetery web site.